This is the second part of a two-part article. Part 1 can be found here. Despite having the second largest number of movie screens in the world, with well over 12,000 as of this writing, China remains one of the world’s most under-screened major territories in terms of movie screens per capita. Whereas the United States has one screen for about every 7,800 people, China only has one for every 112,000. 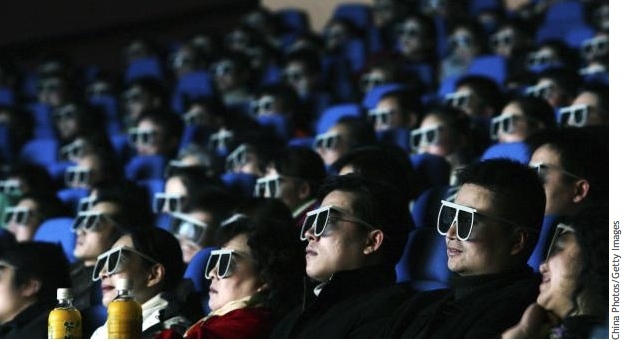 There are numerous cities in China of 500,000 and even 1 million people that have no modern movie screens. For China to be on par with the U.S. on a per capita basis, it would have to open 160,000 more screens. Because the vast majority of China’s multiplexes were built in the past five years, its cinema infrastructure is highly modern and technologically advanced. Of the country’s roughly 12,000 screens, more than 10,000 have digital projection and about 7,000 are equipped for 3D. There are about 3,300 theater locations operated by 45 commercial cinema chains in China, about 2,200 of which can report box office daily. In total, in the first six months of 2012, 1286 theaters each managed to exceed ticket sales of more than 1 million RMB (about US $160,000) at the box office. And about 100 theaters sold over 1 million dollars box office in the first half of the year. Between January and August, 423 new theaters with over 2,500 new screens had opened their doors. Until the new WTO MOU was agreed early this year, imported films entitled to revenue sharing would receive from 13% to about 17.5% of the total box office receipts of their films, depending on how much the movie actually made. “Total box office receipts” is defined as the amount reported by the Office of China Film Special Funds. This figure is almost certainly always under-stated, for reasons we will see below, and because there is a material amount of skimming that takes place at China’s theaters. Before the WTO MOU, if a revenue-shared Hollywood movie earned less than 45 million yuan at the box office then it would only get 13% of the reported gross. Those films grossing more than 45 million yuan would receive as much as 17.5%. After the WTO MOU was agreed, revenue sharing films now receive a straight 25 percent of all box office receipts. Much simpler, and better for the foreign producers. China Film and Huaxia Film receive about 22 percent of the gross from foreign releases. The rest, after taxes, goes to the exhibitors, and amounts to roughly 45 percent of the gross. By way of comparison, local movie producers can distribute their products almost limitlessly and usually they, the producers and distributors combined receive about 43% from the gross. Generally, theaters operators receive slightly more share from Hollywood movies than from local movies. The release date for each and every film is decided by the Distribution and Exhibition Association (DEA), a government office that is a subsidiary of SARFT. Before any film can receive a release date, the finished version of the film must first be approved by the Film Bureau. After that, the distributor submits the film to the DEA seeking a release date. Multi-party negotiations take place among distributors, exhibitors, the Association and sometimes even the Film Bureau, regarding the date of release. The film is only officially dated after the DEA provides the corresponding release licenses and notification, which can happen as late as just a few days before the film’s opening. The bigger the movie is, the harder it is for it to get a quick approval and date, especially for imported films. Hollywood’s major studios are completely at the mercy of this dating process, with no real say of their own, since they are not the distributors. For foreign buyout movies, the local distributors can play a limited role. For local movies, the local distributors have much greater influence over their films’ dating. The discussion below pertains mainly to imported foreign movies. Once approved by the Film Bureau, a film will be delivered to a certain local studio (usually Shanghai Film Studio or Beijing Film Studio) for dubbing, subtitling and printing. In the case of revenue-sharing imports, the foreign studios pay for this service; for buyout movies the local distributors usually pay. Most movies’ marketing campaigns in China begin at this point. There is no point in spending money on advertising until the movie’s release date is set. This process usually allows far less time for marketing a movie in China than in most other territories. Before 2012, most movies still used physical release prints for distribution. But since early 2012, printed copies are becoming rare, mostly because almost all theaters now only do digital projection. Prints, which usually cost about 10,000 yuan per print, have been eliminated because they’re too expensive. Before this year, low budget buyout movies usually received only limited releases, but with the lower releasing costs of digital distribution, it is now possible for these same low budget buyout movies to enjoy wide releases. In the heyday of physical prints, a wide release usually meant a few hundred printed copies. One of the biggest physical print releases, Transformers 2, went out on roughly 700 prints. Nowadays, a wide opening can cover more than 2,200 theaters. Fewer than 1,000 theaters, mostly single-screen older cinemas, run physical prints, typically days or weeks after the film’s initial release on digital copies, so they are unable to contribute much to a film’s total gross. Among all the imported movies in 2012, almost none used prints, except for the four non-digital IMAX copies of The Dark Knight Rises. A digital copy of a film can only be projected if the theater has the appropriate digital key. All keys are released and managed by China Film Group. The keys expire every 15 days. Usually a big movie can have its key renewed and enjoy 30 days of initial wide release, after which a two week extended limited run usually will follow. However extended runs weren’t allowed this past September for releases like The Dark Knight Rises, The Amazing Spider-Man, Prometheus and The Expendables 2. Sometimes extensions can be authorized twice or even more for a movie with strong legs. For instance, Mission Impossible 4 managed seven weeks in the top 10. Its entire run lasted from January 28 to March 31, 64 days. Along with Inception this was the longest run for a movie since Avatar. MI4 had very strong word of mouth that carried it to a 6X multiplier of its opening weekend after a record-breaking two-day opening. But Avatar, remains the multiplier king. Opened on January 4, 2010, many theaters were still showing the film in May. Some theaters were even showing it in November 2010. Shanghai’s Heping IMAX theater sold out every single IMAX show for Avatar for almost three months. Generally, the Hollywood studios pay the marketing and advertising costs for their films that are released in Chinese theatres, while CFGC or Huaxia (or both of them) pay for prints (they also might pay for the printed posters/theater standees in cinemas). However, studios are only allowed to do limited advertising on the internet and in outdoor venues due to protections for local films. Direct advertising on TV for Hollywood films is not allowed, which is the most effective way to market a movie in China. And since TV ads are relatively too expensive for local films, TV spots for local movies are rare to see in China. The most common ways of marketing a movie in China are via internet ads (cheap, easy and sometimes very effective) and in cinemas (traditional and effective). Two years ago, many trailers for both Hollywood and local movies could be seen before a movie but now Hollywood trailers have disappeared in most China theatres. What happened? Hollywood trailers were replaced by ads for cars, real estate, shopping, and local films. Why? Because most (80%+) screens in China are now digital and trailers and ads are now easily removed. Hollywood studios have weak control on distributing their films in China despite the fact that they pay for the majority of the advertising. The biggest marketing campaigns so far belong to Avatar, Transformers 3, and Titanic 3D. Outdoor banners and billboards for Hollywood tent-pole movies can often be seen in crowded places and heavily-trafficked urban areas. Though they can’t air spots on cable TV, studios like Sony often show movie spots on advertising screens in the Shanghai subways. It was reported that about 800,000 yuan was spent for doing such ads for two weeks to promote Men in Black 3. There are only three regular box office report outlets that currently exist in China, but their numbers are very limited, they are not quite accurate and not quite official. The big movie sites in China have been reporting weekly top 10 numbers since 2008, claiming to receive their numbers from an organization which is part of SARFT/ Film Bureau. Box office numbers can also be found on Weibo.com, the most popular Chinese social media site, every Tuesday. The numbers from the various reporting outlets usually differ slightly from each other. So which one to quote? Any one can be quoted since all reporting is just estimates after all. The raw data they are reporting comes from the Office of China Film Group Special Funds because only the Special Funds have the raw daily/weekly box office numbers. The Special Funds have a nationwide theater-based computer ticket counting system which covers most commercial theaters in China. Currently only 674 top selling theaters can be tracked by the system in real time. This part usually accounts for 70% of a movie’s total box office. Over one thousand other theaters can do day-end (usually around 02:00am when theaters close) or next-day (usually around 10:00am when daily business begins) ticket sales reports. And by next late morning, usually about 1,900 to 2,200 theaters have reported box office for the day before, and by that time, as much as 95%-97% of a movie’s (daily) box office has been reported. The rest comes from hundreds of other theaters that report on a weekly or even monthly basis. Unfortunately the Special Funds don’t do any weekly/daily report themselves, though they do offer paid subscriptions to certain media outlets. Weekly box office reports are all based on the Special Funds numbers. And since the movie website reports seem to be the most accurate, we use their numbers here, sometimes augmented by other sources if necessary. The revenue-sharing figures provided to studios and distributors come from the Special Funds accounting reports even if there are still theaters that didn’t get counted by the Special Funds. For example, a film may wind up actually grossing 105 million RMB at the box office, but only 97 million of the 105 million was reported by the end of its run. The 97 million will be shared by the Special Funds, distributors, exhibitors and foreign studios. Three months later, another 5 million would be reported, so the 5 million will be shared in the same way. Another revenue share will happen if extra money is found later. By the end, if only 103 million gets reported by the Special Funds, 103 million will be the movie’s final box office number, that is, the clearing/accounting number. 2 million gets lost in the long run. Again, take Avatar for example: no one really knows how much it lost in this way. Generally conservative estimate put its loss at a whopping 200 million yuan. In total, only a few dozen people in China can get full access to the Special Funds data system. Dozens of local film distributors can also get into the system, but only for their own distributed movies. The China branche offices of Hollywood studios have no authority to access the Special Funds reports. The only way for them to confirm the numbers reported to them by China Film or Huaxia Film is to do local checking with every theater and theater chain. Apart from the Special Funds, there is another national wide box office statistics agency: China Film Distribution and Exhibition Association (the DEA). The DEA box office statistics are based on exhibitors’ initiative report, including theaters that don’t even have computer sale systems, though their report can take months to compile. As a result, the DEA numbers will usually be a little higher than the Special Funds. But the DEA never releases weekly numbers publicly, just monthly, quarterly, half-yearly, and yearly numbers. China’s official year-end reports tend to use the DEA numbers, not the numbers that are reported to studios, distributors, or exhibitors in Special Funds accounting reports. For example, say The Dark Knight Rises made 329 million yuan according to the Special Funds while 345M according to the DEA final number, it is the 329 million figure that matters to Warner Brothers, since that is the number from which they ultimately collect their revenue share. Chinese theater operators, distributors and film producers widely acknowledge the flaws in China’s theatrical distribution and accounting systems, and SARFT appears to be taking these issues seriously. China has only been in the modern multiplex business for a few short years, and steay improvements are constantly being made. Whether these improvements will ultimately benefit foreign movie suppliers still remains to be seen. This entry was posted in Analysis, General News and tagged buyout movies, China Film Group Corporation, Exhibition Association, Film Bureau, Huaxia, Office of China Film Special Funds, revenue-shared movies, Rob Cain, Robert Cain, SARFT by chinafilmbiz. Bookmark the permalink. Excellent insight , as usual. Just bumped into the Chinese movie distribution system recently and this is the best piece of writing I’ve come across. Excelent job!